Two coats of 15 Minutes of Frame and Creative Fantasy, followed up with one coat of Collage Overlay and Whirled Away. 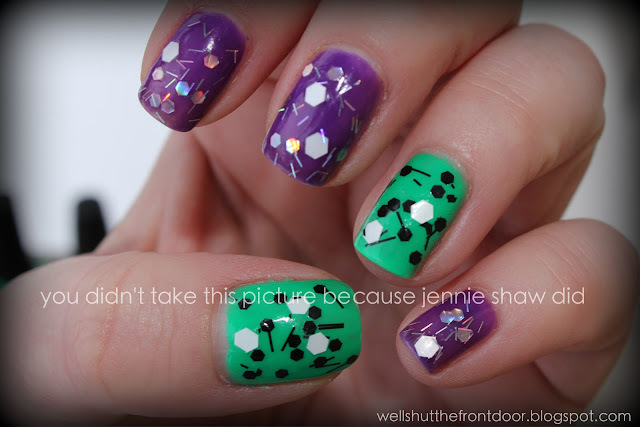 And here's a tip if you're using a polish with larger chunks: Wait until your base coat is completely dry so you can move the confetti bits into place with a toothpick as they don't want to cover evenly. If your base coat isn't totally dry, then it'll smudge and leave streaky lines (grrrrr). How fun I love the color combo! where do you get all these cool glitters?! I love the glitters ! First- the watermark/caption on your photos-I love it! Second LOVE THE accents on it! I love the purple too! As always, yours nails look fab-u-lous! I recently bought Whirled Away and mine is pretty thick, so I need to thin it out to make it a bit more manageable. I paired it with CG Flip Flop Fantasy and loved it! I love the green combo with it too! Seriously, I cannot stop looking at your nails. They're so lovely! Best color combo I've seen in a while. I love that green shade! Great tips about chunky glitter. Mine always gets clumped together. love love love the glitters! 15 Minutes of Frame is super gorgeous!